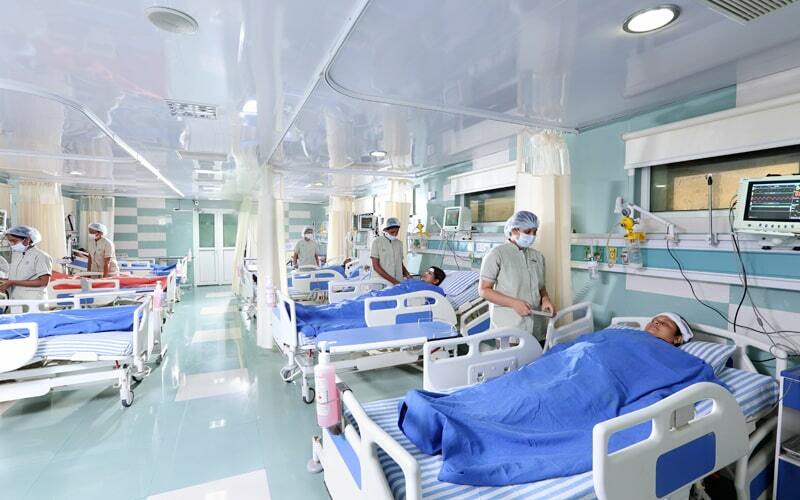 The care provided in a hospital generally involves services rendered in different settings such as Wards, High Dependency Units (HDU) and Intensive Care Units (ICU). Intensive care can be broadly classified as a service for patients who have potentially recoverable conditions and can benefit from a more detailed observation and treatment that can be provided safely in a ward or HDU. Such cases normally include threatened or established organ failures mostly arising out of acute illness , trauma or as a predictable phase in the treatment plan. • Set in well defined separate areas in a sterile and safe environment. • An identified consultant to direct the treatment plan, with support from the in-house multidisciplinary teams. • Round the clock medical care by specialist nurses, physiotherapists, dieticians and other technical staff. • A minimum nurse to patient ratio of 1:1 along with additional resources depending on patient specific needs. • Effective communication between the teams involved in the treatment plan. • Modern equipment and measuring systems to support common organ system failures, in particular, ventilatory, circulatory and renal failures. • Documented and clear operational policies for providing clinical, technical and administrative support. • Continuing education and training of medical and nursing staff.